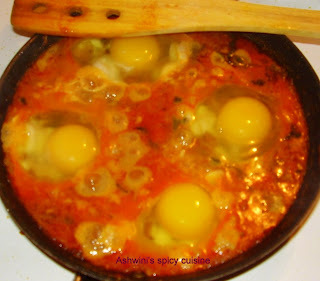 Egg curry can be made in different ways, the one i am gonna show u is the easiest recipe!!!. Egg curry goes well with rice and chappathi. Heat a non-stick sauce pan, pour oil and wait until hot. Add mustard , fennel seeds and curry leaves. Add green chillies and chopped onions, saute in medium heat till the onion turns pale. Ginger garlic paste should be added to the onions and fry for few mts. Once the raw smell of ginger garlic vanishes, add tomatoes and fry for 10 mts. Add 1 cup of water cover and cook till the tomatoes get mushy. Add redchilli, turmeric and garam masala powder. mix well and add the remaining water. cover and cook for 10 more mts. 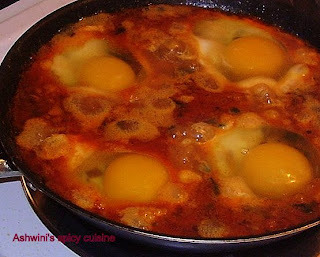 The oil will be separated on the corner of the pan, the time when u need to break the eggs one by one into the curry. Cover and cook. Don't use spatula to mix them, let it cook in the curry. After one side of the egg is boiled, just turn the egg to other side. Alternatively, U can boil the egg, make small cuts and add to the gravy. I like to boil the egg in the gravy, coz egg will have the flavour of the curry. Cook for 5 mts, garnish with coriander !!! !